Spoutable is an online platform or digital advertisement company with a vast range of effective advertising experiences and superior website monetization. It monetizes the websites in an efficient manner with the help of digital advertising technologies. Spoutable review each site before accepting them.It gets the advertisements from the advertisers and publishes those advertisements over the websites with the support of the publishers or website owners. 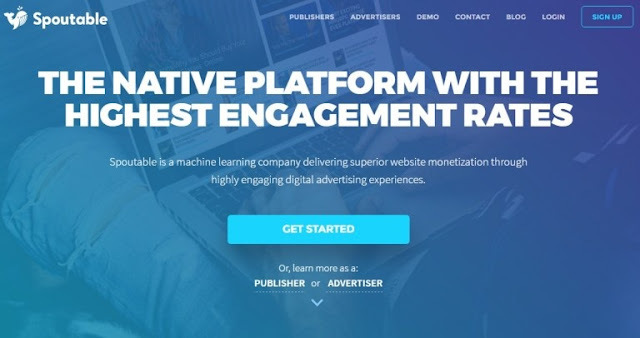 The users (advertisers and publishers) can make use of this unique advertising platform by registering at Spoutable website. It is an premium ad network which was launched in 2014 with its headquarters in San Diego, California, United States. It has its branches in Chicago, New York and Los Angeles. Its founders are Keiran Flanigan, Grant Bostrom, Ryan Bettencourt, Evan Witte, Josh Schlesser and Jon Belmonte. At the initial stage, its size was only around 50 employees, but now it experiences a massive growth. Spoutable.com now serves about 1.2 B+ page views per month. It is a risk – free, simple and easily – usable platform for both the advertisers and the publishers. It holds a highly supporting team, which is responsible for guiding all the users on the site. It effectively manages the website traffic. It does not facilitate any agreement or contract like other advertising platforms. The users of this site can be able to save their valuable time and can also be able to earn more money when compared to the other platforms. It has work experience with several top companies in the world such as ‘Chicago Tribune’, ‘Verizon’, ‘Cheat Sheet’, ‘Gateway Media’, ‘Meredith’, ‘L.L. Bean’, ‘Life script ’, ‘Parent Society’, ‘Pottery Barn’, ‘Universal’ and so on. It is a highly flexible platform with greater support. A variety of media like video, content, commerce widget, email and quick link are mixed together in spoutable.com for better performance. This mixing can be done with the help of the site’s machine learning strategy. It completely satisfies the demands and needs of the advertisers as well as the publishers or website owners. It is a common platform for the advertisers and the website owners. It helps the publishers or website owners to get a high profit via the publishing of advertisements. This can be achieved through the aspect of less monetization time as well as the special approach offered by the site. It allows the publishers to select various website zones such as bottom, top, in-page or overlay for better monetization of their sites. This can be achieved with the help of a single tag integration mechanism that is responsible for reduced time consumption and revenue management. It influences the advertisers for an increased rate of ROI by effective audience-engagement. Its major scope is that it gives performance assurance to the advertisers, while advertising in this site. It guarantees an increased Ad view rate to the advertisers. Hope this Spoutable review will be helpful for both publishers and advertisers. In case you have already used it before, share your experience with us in the comment section below.